Bob Wilson, the weed specialist at the University of Nebraska’s Panhandle Research & Extension Center is retiring this month. Dr. Wilson has been a long-time mentor to me, serving as advisor for my M.S. and co-advisor for my PhD. Since then, we’ve collaborated on many projects aimed at helping sugarbeet producers better manage difficult weeds. 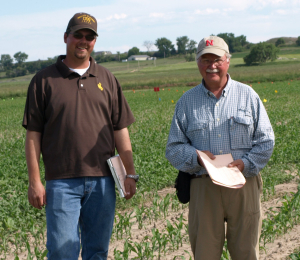 UNL’s Crop Watch has a really nice writeup today about some of his career highlights. He discusses some of his thoughts about changes in weed control over the last 40 years, and about how funding for weed science research has evolved. I’d encourage you to read the entire post here, but some interesting tidbits are below. Understanding weed seeds, including how they move in water and their viability in the soil. Studying the effect of cropping practices on weed seed germination. Battling Canada Thistle. Wilson said we now understand how it grows and winters, and how to use those biological factors and chemicals to control the noxious weed. Improving weed control in sugarbeets and dry edible beans. When Wilson started, there was one herbicide labeled for use in each crop, and farmers mold-board plowed and incorporated herbicides before planting. Now there are more chemical options, less tillage, and a more integrated approach to weed control. Learning about weed control in riparian areas, including the effects of invasive species on water movement and the productivity of riparian areas. Discovering that planting competitive grasses will suppress some weed problems. In recent years, Wilson has seen another shift in the industry, away from new herbicides. No new herbicides with new modes of action have been introduced to the market in the past few years. Over the next 10 years Wilson expects herbicides will still be important to weed control, but he expects the emphasis to shift away from chemicals and toward cultural practices. “I expect more pressure from the public to move away from chemicals,” he said. More biological products are likely to become available, such as a biological pathogen that kills weed seeds, but not the crop. He said a new way of funding research is needed. The current federal government plan is designed to support basic research, which doesn’t address the practical problems facing farmers, communities and the public. One of the best funding sources is agricultural commodity boards that direct the spending of commodity checkoff revenues for research and marketing programs, Wilson said. They provide an industry connection, input, and direction for research. Commodity board research programs provide a research foundation that can be built on as industry needs change. Next Article Glyphosate and Cancer: What does the data say?